Researchers consistently elicit surprise and dismay when they report on the pervasiveness of academic dishonesty. Cheating on examinations, and in particular the practice of copying answers from other students, has spurred educators to devise statistical methods that can expose it. This paper surveys the main issues in the copy detection field, examining four methods in detail. I apply these techniques to data taken from a university examination, and I compare the four with respect to ease of calculation, prevalence of use, and rates of sensitivity and specificity. I also give an overview of other copy detection methods, discussing key issues to consider, limitations that apply, and factors that inhibit the adoption of these techniques. An appendix briefly touches on the detection of cheating by impersonation and by improper erasures. Full text available for $5.95. Follow the Yellow Brick PayPal link below. Your article should arrive within two days. Word Cloud derived from frequencies of word use in the paper. copyright 2007-2012 by roland b. stark. The best thinking does not result in smoke after the flashing fire, but in light emerging from the smoke. You cannot have a democracy without a statistical system that is objective and accurate. Many things in life just cry out not to be explained. 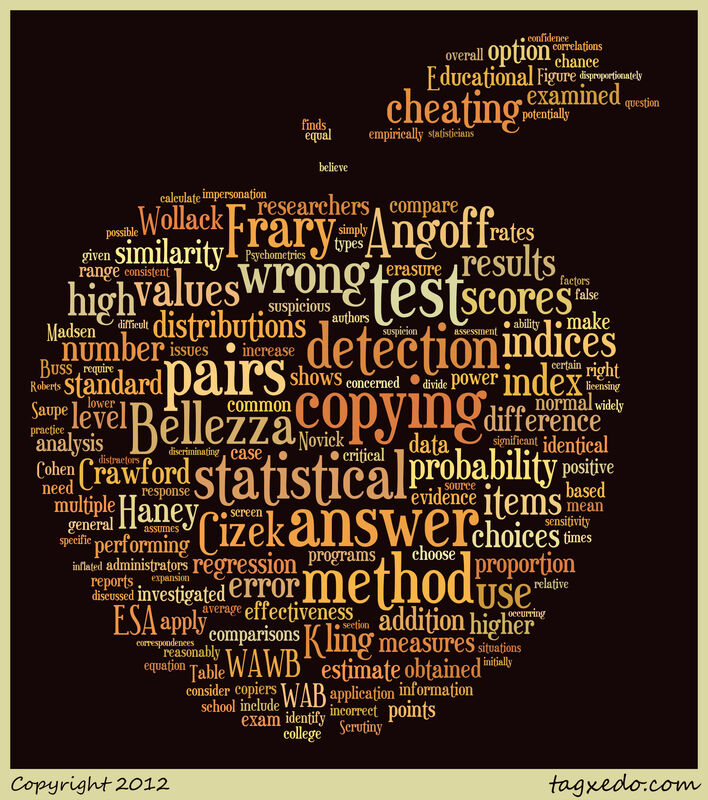 New statistical methodology is often applied promiscuously, more so if it is complicated, computer-based, and hard to check. The process of connecting it back to the basic principles of statistical inference comes later, but in the long run no methodology can survive if it flouts these principles. Some people find "Call me Ishmael" unforgettable while others become giddy with anticipation reading "Let Uo be the unit vector and X1 through Xn independent variables with Y as the dependent variable" or "consider the symmetric matrix R." When it comes to the written word there may be no accounting for taste. While it may be premature in some cases and unreasonable in others to expect to form lawful relationships between social variables, we shall certainly never do so if we give up the attempt.